NOW look. You've been whining about this since 1767 and it's starting to get on my wick. I've ignored you until now, because you're very silly and your greatest cheerleader is Sean Penn, a man who pretends to be things he is not and once hit his then-wife Madonna with a baseball bat, tied her up for nine hours and abused her. If he is on your side, it's not a good side to be on. 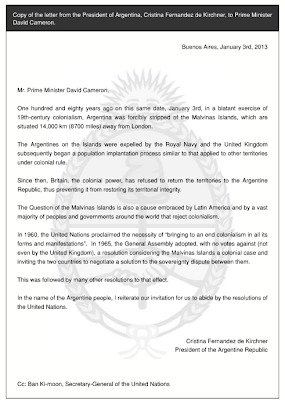 But today you've written to Prime Minister Dishface demanding he enter negotiations to 'return' the islands we call the Falklands and you call Malvinas, 180 years after we cruelly stole them from you with our jackbooted naval officers of totalitarianism. You were 'forcibly stripped' of these jewels in the South Atlantic and your people were 'expelled'. Only, that's not quite what happened, is it Argentina? Someone obviously needs to remind you, and probably Mr Penn too, of the facts. Allow me to start by saying there are probably things we can all agree on. War is bad, for example, and colonialism - aside from the roads, aqueducts, education, health reforms, economic development, culture, food, integration and innovation - tends to be a bad thing too. We could probably avoid an argument over the fact that the Falkland Islands, in and of themselves, aren't exactly pretty. There are no hanging gardens, no waterfalls, no exotic wildlife. They're a windy bunch of rocks a long way from anywhere, although I grant they're nearer to you than they are to us. Which begs the question about why, exactly, you never bothered to settle them. When they were first discovered by a Dutchman in 1600 there was nothing there but seabirds. No people, no cultural heritage for anyone to trample over. Just a windy bunch of rocks. Ninety years later a British sailor was blown off course and sailed through a bit of water he named Falkland Sound, and 74 years after that the French turned up to form a colony. WAIT! I hear you cry. 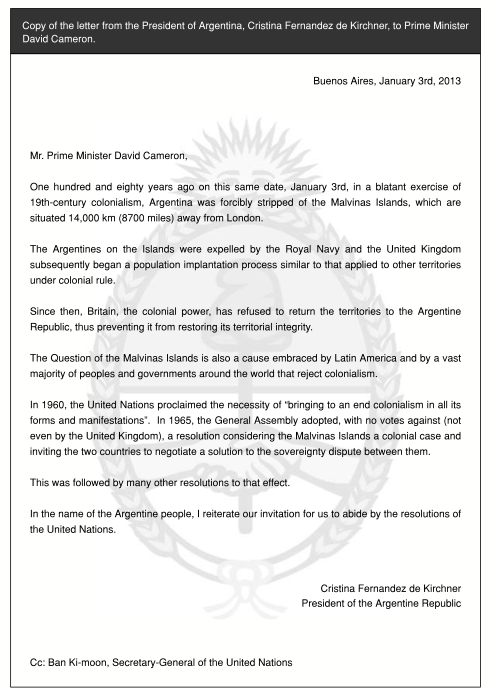 The French colonised the Falklands? Why yes, and 18th century email being what it was the British turned up two years later and built a settlement on another one of the islands and claimed the whole lot for the Crown, unaware the Frenchies were already in residence. The French sold out to the Spaniards a year after that, who put the colony - containing French people - under control of a governor in Buenos Aires. Three years later the Spanish picked a fight with the Brits, kicked them out and after a peace treaty let us back in. In 1774 the Brits, overstretched by the Americans kicking off, withdrew and left a plaque behind asserting their claim. Thirty two years later the Spaniards departed too, leaving another plaque, and in 1811 the last settlers threw in the towel. We were back to empty, windy rocks known only to whalers and sealing ships, and two memorial plaques. In 1820 an American pirate called David Jewett took shelter there, and finding the place deserted promptly claimed the islands for a union of South American provinces which later became Argentina. You lot didn't realise this for a year, but still didn't settle the islands. Instead a German who pretended to be French called Luis Vernet came along, asked the Argentines and the Brits politely if they minded, and founded a little colony of his own. It took him a few goes, but eventually he established a settlement, you named him governor and gave him the right to kill all the seals. This quite hacked off the Brits, who wanted some seals for themselves, but Vernet placated us by asking for our military protection. It all got a bit hairy in 1831, when Vernet found some American seal ships, arrested their crews and sparked an international incident. The Americans sent a warship, blew up the settlement, and hot-headedly sent the most senior settlers to the mainland for trial for piracy. The Argentines sent a new governor to establish a penal settlement, but he was killed in a mutiny the day he arrived. The Brits, quite reasonably, decided the whole thing was a dog's breakfast. And now we get to the bit you're unhappy about Argentina, the invasion and forced expulsion. "I have to direct you that I have received directions from His Excellency and Commander-in-Chief of His Britannic Majesty's ships and vessels of war, South America station, in the name of His Britannic Majesty, to exercise the rights of sovereignty over these Islands. It is my intention to hoist to-morrow the national flag of Great Britain on shore when I request you will be pleased to haul down your flag on shore and withdraw your force, taking all stores belonging to your Government." Now, there are many ways people can be oppressed, forced, compelled and abused - just ask Sean Penn - but a polite note is not one of them. The Argentine in charge thought briefly about resisting, but he didn't have many soldiers and besides, most of them were British mercenaries who refused to fight. 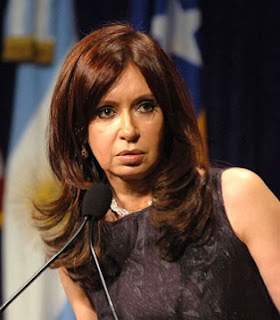 So on January 3, 1833 you left, Argentina, with wounded pride and your nose in the air. You had never settled the islands. Never established a colony of your own. Never guarded it with a garrison of your own soldiers. They had never, ever, been yours. And now to the matter of that expulsion. The log of an Argentine ship present at the time records the settlers were encouraged to stay, and those that left did so of their own free will and generally because they were fed up with living on some boring, windy rocks. Eleven people left - four Argentines, three 'foreigners', one prisoner, a Brit and two Americans. Twenty-two people remained - 12 Argentinians, four Uruguay Indians, two Brits, two Germans, a Frenchman and a Jamaican. As the imposition of colonial power on an indigenous population goes, that takes some beating. And for the sake of clarity I should point out that a human melting pot like that makes the place about as British as you can be. A few months later HMS Beagle, taking Charles Darwin to the Galapagos for a long think, popped in and found the settlement half-ruined and the residents lawless. There were several murders, some looting, and in 1834 the exasperated British sent Lieutenant Henry Smith to run the place. The islands have been ours ever since, and is now home to almost 3,000 people descended from settlers who came from Britain, France, Scandinavia, Gibraltar, St Helena and Chile. At the same time, you went on to fight wars with most of South America and colonise provinces with indigenous populations by killing or pushing them out. 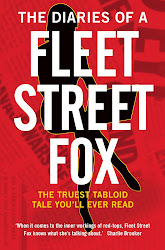 When your government was broke and facing strong opposition in the 1980s, you invaded them to divert attention of the voters with the cost of 907 lives, and it cannot be unrelated to your letter that in a few weeks you face being ejected by the International Monetary Fund for lying over your economic figures. At around the same time, the people who now live on these boring, windy rocks in the middle of nowhere are having a referendum about who they would like to govern them. You will ignore this, because you believe they do not have a right to make up their own minds and have repeatedly refused to talk to the islanders about your claims. So allow me to make a couple of things clear. Firstly, the history of these windy rocks is an utter mess but someone had to take charge, and you weren't up to the job. We did it pretty nicely, considering our record in other places. Secondly, only jackbooted colonial scumbags refuse to listen to the democratic voice of the people who live somewhere, so you really ought to wind your hypocritical warmongering necks in. And thirdly - well done with the wine, and the beef's pretty good, but if you want to negotiate let's start with you taking back your Total Wipeout, because as cultural imperialism goes it's pretty offensive, and you might want to think about handing Patagonia back to its people as well. After that we are quite prepared to let you come and holiday on these windy rocks, where you will be invited to pitch a tent anywhere you like within the 13 square kilometres where you left 19,000 landmines last time you visited. We know they're a long way away. We know there's not much to the rocks, and there might be oil and it might give someone a claim to Antarctica. But we also know something you don't - which is that a well-run, law-abiding and happy bunch of rocks is the best bunch of rocks you can hope to have. You're no more up to that job now than you have ever been. In case our position is still not clear, the above could be summed up as: No. PS Can we interest you in Julian Assange?